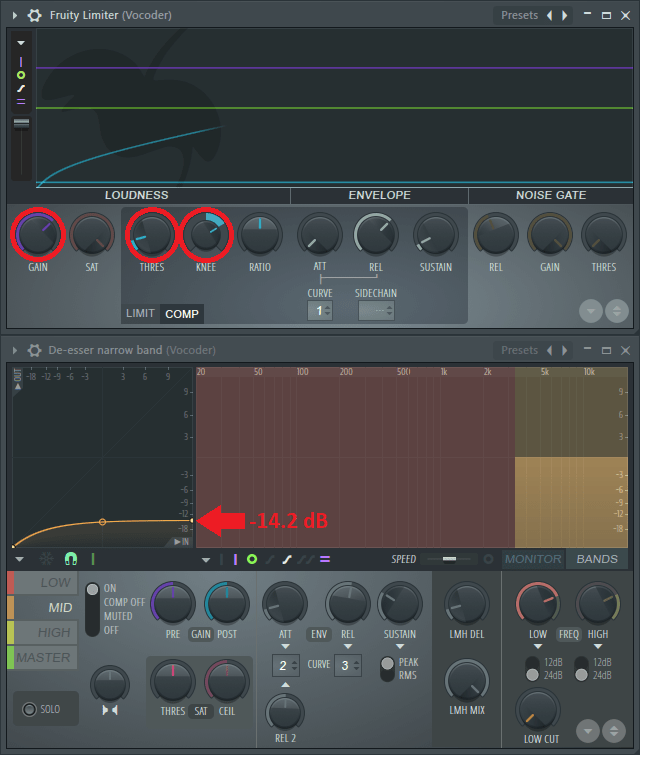 In FL Studio, there are two plugins that we can use to create a robotic voice effect. In this tutorial, you’ll learn how to use Vocodex and Fruity Vocoder plugins in FL Studio to create and record your own robot vocals. Let’s get started! Note: You will need FL Studio Producer Edition or higher to record vocals. FL Studio Fruity Edition does include the Fruity Vocoder plugin, but you will not be able to use it for live voice synthesis. See the feature comparison on Image-Line’s web page for more details. The word “vocoder” is a combination of the words “voice” and “encoder”. They were originally developed by telecommunications engineers in the 1930s. The goal back then was to make human voice easier to transmit over long distances and to encrypt radio communications. This prevented the enemy from listening in on sensitive information sent over radio. Using many of the same principles, engineers at the Siemens Studio for Electronic Music began experimenting with vocoders for use as instruments in the mid-1950s. In the 1960s, several engineers including Robert Moog, founder of the Moog synthesizer, made further developments and advancements in the field of vocoders as speech synthesizers. Since then, vocoders have evolved and made their way into mainstream music and film production, especially electronic music. These modern vocoders can mix human voice with synthesizers to create a robotic vocal effect. Big-name artist like Daft Punk have made the sound and style immensely popular. Vocoders can be found in many subgenres of trance too. The intro to this psytrance remix is a great example of what a vocoder sounds like. Vocoders split the modulator signal, which is usually a voice coming from a microphone, into pieces called bands using a series of band-pass filters. The filters are each assigned a range of frequencies to operate in within the frequency spectrum. The range and coverage of each band is determined by the filter band width and the number of bands being used. The vocoder then analyzes the signal level of each band and uses the band levels and frequencies like gates. They let the carrier signal through based on the levels and frequencies present in the modulator bands. This effectively mixes the spectral data of the human voice with the synthesizer to create an insane robot voice effect. 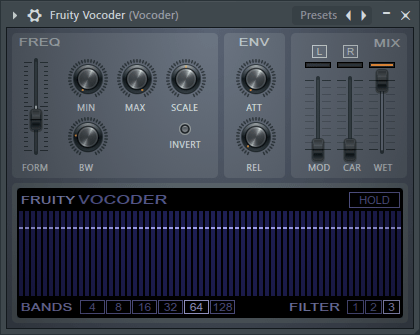 Fruity Vocoder is a zero-latency vocoder plugin by Image-Line. In this plugin, your voice will be deemed the modulator MOD and the synth you choose to mix your voice with will be deemed the carrier CAR. Name the Mixer track “Vocoder”. Center wheel-click on the track to rename it. You can change the color from here too. Add Sytrus and choose a Sytrus vocoder preset. I think Bright sounds the best, but there are a few others in there that sound really good as well. You can find them under Vocoder carriers in the preset menu. Then, route Sytrus to a blank mixer track. Now, your Carrier and Modulator should both be routed to the Vocoder, and the Vocoder should be routed to the Master track. You can play around with different notes and chords, and even change the pitch in Sytrus in real time to simulate tonal changes in human speech. You can also experiment with the FORM fader in Fruity Vocoder. 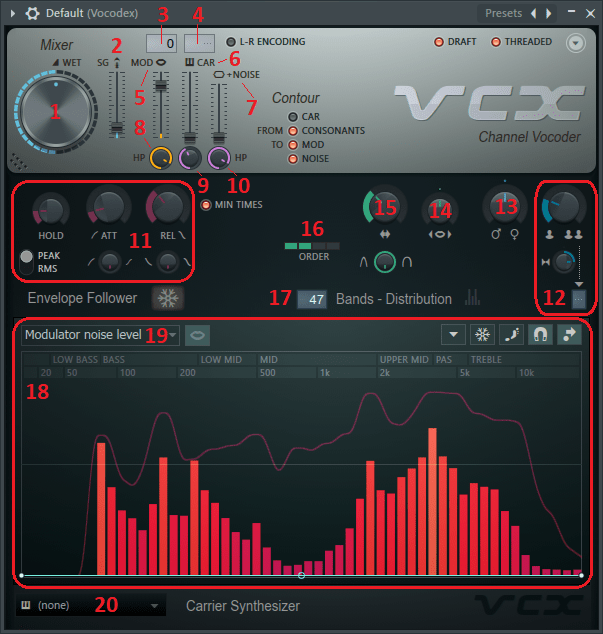 OK, now on to part two with the other popular FL Studio vocoder plugin, Vocodex. A simpler setup mode where the carrier is a built-in Sytrus engine with the same vocoder presets as the Fruity Vocoder example in Part 1 of the tutorial. The modulator is the mic input routed directly into to the same mixer track as Vocodex. Change the Modulator sidechain input number to 0. This is telling Vocodex that the modulator signal is coming from the same track that Vocodex is hosted on. Change the Carrier sidechain input number to — blank. This is telling Vocodex to use the internal Sytrus engine as the carrier. Select a Carrier tone from the bottom menu. These are the same Sytrus presets from before. Choose a key or multiple keys from the keyboard to use as the carrier key. Once selected, these keys will stay pressed until you click them again. Without speaking, select Detect modulator noise level from the drop-down menu. This applies a noise cancellation envelope to the modulator and gets rid of any background noise that may be modulating the carrier. This mode is not very flexible since the keys in the built-in Sytrus engine are not linked to the Piano roll and cannot be programmed into a pattern to dynamically change with time. I suggest using the Advanced setup, since it overcomes this by allowing for an external carrier just like in the Fruity Vocoder example. This is a more advanced setup mode where the carrier comes from another Mixer track that’s external to the Vocodex track through a sidechain input. We can also set this up to have the modulator come from an external track, but it works just fine with the modulator routed directly to the Vocodex track. Any processing or recording you want to have done prior to Vocodex in the signal processing chain can be added to the Vocodex mixer track itself and arranged accordingly like we did with Edison and Maximus in the simple setup. Change the Carrier sidechain input number to 1. This is telling Vocodex that the carrier signal is coming from the external Sytrus Carrier track. Without speaking, select Detect modulator noise level from the drop-down menu. This applies a noise cancellation envelope to the modulator and gets rid of any background noise that’s being used to modulate the carrier. This method allows you to program MIDI data in the Sytrus carrier’s Piano roll, and then orchestrate it along with live vocals or vocal recordings in the Playlist. We’ll cover that later in the tutorial. …you’re probably wondering what all those fancy buttons, knobs and faders do in Vocodex. Let’s take a look at some of them. WET Vocodex wet mix level – this is basically Vocodex volume being sent out of the plugin. SG Soundgoodizer mix level – Soundgoodizer is just a Maximus preset in disguise. It can help make Vocodex “louder” and more clear-sounding. Modulator sidechain input number – 0 is telling Vocodex to take the modulator from the same track that Vocodex is hosted on. 1, 2, 3, etc. is telling Vocodex to use a modulator from a track that’s been sidechained to the Vocodex track. Carrier sidechain input number – — is telling Vocodex to use the internal Sytrus carrier. 0 is telling Vocodex to use a carrier routed to the same track Vocodex is hosted on. 1, 2, 3, etc. is telling Vocodex to use a carrier from a track that’s been sidechained to the Vocodex track. MOD Modulator pass-through level – how much of the original modulator signal is mixed in with the vocoded signal. This can make the make the spoken vocoded words more coherent, since you are mixing in some of the original voice. CAR Carrier pass-through level – how much of the original carrier signal is mixed in with the vocoded signal. +NOISE Carrier added noise level – how much white noise is added to the carrier. If you are using a carrier that does not share some parts of the frequency spectrum with the modulator, you can add white noise to the carrier to fill in the gaps. This can help to make the spoken vocoder words more coherent. White noise is a waveform with equal amounts of all frequencies across the entire spectrum. HP Modulator pass-through highpass filter cutoff frequency – modulator pass-through mixes the original voice with the vocoded voice, and this is a high-pass filter that is applied to the modulator pass-through signal so you can control what frequencies of the modulator will be present in the final vocoder signal. If your carrier lacks higher frequencies, you can turn up the filtered modulator pass-through and set the filter cutoff frequency to the frequency that your carrier starts to drops off at. Carrier pass-through lowpass filter cutoff frequency – it is safe to say that we are now speaking another language. Use this if you’re lacking some low-end in the final signal. HP Carrier added noise highpass filter cutoff frequency – controls what part of the spectrum you want noise in. Modulator attack, release, hold and tension settings – these can control how long it takes for the bands to react to the modulator input signal. Modulator unison shift, panning, and order – unison is when two or more waveforms with very similar timbre are mixed together. This setting lets you multiply the vocoder signal (unison order) and then apply small deviations in pitch across each new voice (pitch shift). You can also add a widening effect with the panning knob. Band width multiplier – a low setting will make a more resonant sound, and a high setting will produce a raspy sound. Band width – controls the frequency range of each band. ORDER – this controls the roll-off (attenuation rate) of the left and right sides of each band-pass filter. 4 is a steep slope, 1 is a gentle slope. Bands – choose between 5 and 100. As a rule of thumb, more bands will sound more human, and less bands will sound more robotic. Modulation mapping settings – this lets you apply EQ, saturation, pitch shift, band panning etc. to the bands. Carrier tone – choose from theses Sytrus presets when using the Vocodex internal Sytrus engine as the carrier. The Image-line website has more info on all of this, and goes into more technical detail. I defer to them, because if you’re still reading at this point, you’re either getting bored or you’re just one of the 1 in 10 people who take mixed amphetamine salts on the reg. You know who you are. I suggest just playing around with the settings and listening to get a feel for what they do. The last part we’ll look at is recording and orchestrating your voice recording with the carrier in the Playlist. 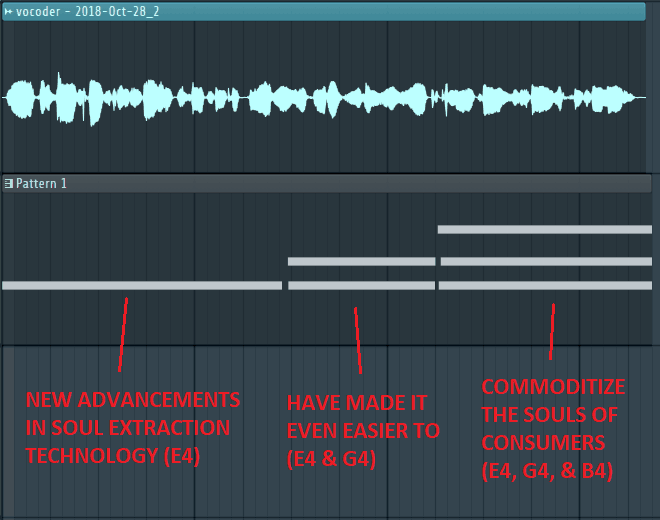 The process is the same for both plugins/methods. This won’t work if you’re using the Vocodex internal Sytrus engine as the carrier. We’ll record the dry vocal waveform using either of the two Edison’s that we placed in the modulator mic input Mixer tracks earlier. Once we have a recording, we will place it in the Playlist along with a Sytrus carrier Pattern. This ensures that they are both sent simultaneously to the vocoders. Add Fruity Balance in Slot 1 of the Modulator mic input Mixer track. 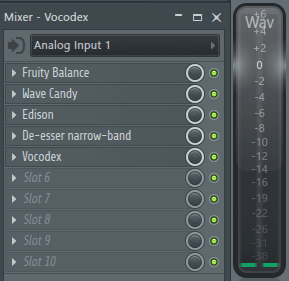 Between Edison and Fruity Balance, add a Wave Candy with the meter setting. Speak into your mic as you would when you’re recording and adjust the Fruity Balance volume so that your peak level in Wave Candy is around -10 dBFS. Open Edison and begin recording. Do any editing you want in Edison, and then send your clip to the Playlist. Go to the Channel rack, find your new vocal recording, and route it to the modulator Mixer track. Turn off or reset Fruity Balance volume in the modulator Mixer track. Turn off or disconnect your mic from the Mixer track to avoid feedback. Alternatively, you could have routed the mic to a different Mixer track and just muted it. For recording, your modulator Mixer track should look something like this. 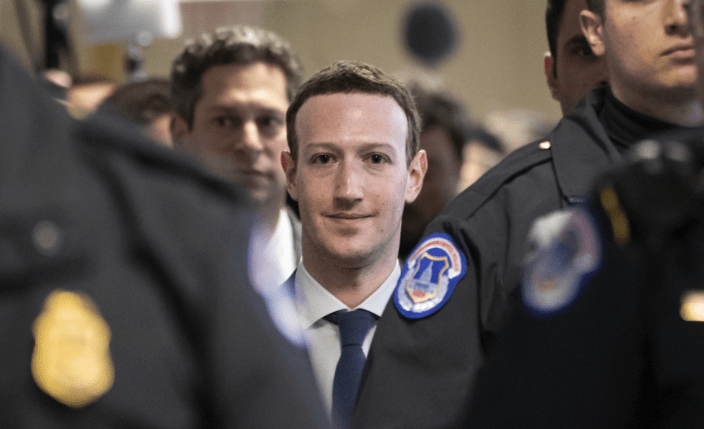 Above, you can see how I made the Zuckerborg AI voice. Now, when you play them in the Playlist, everything should sync up and you should hear your vocoded voice. To make it even easier, you can record the vocoded voice in another instance of Edison after Vocodex. Next, just stage that in the Playlist instead. However, you may lose some flexibility in your mix that way. It’s up to you, there are lot’s of ways to do it. If you’re still with me from the start, thanks for reading. This can be TONS of fun to mess around with.. sorry Mark. If you liked this 100% free FL Studio tutorial, let me know what else you’d like me to cover in the comments, on the Synaptic Sound Facebook page, or YouTube channel! And be sure to check out the complementary infographic! Peace out.